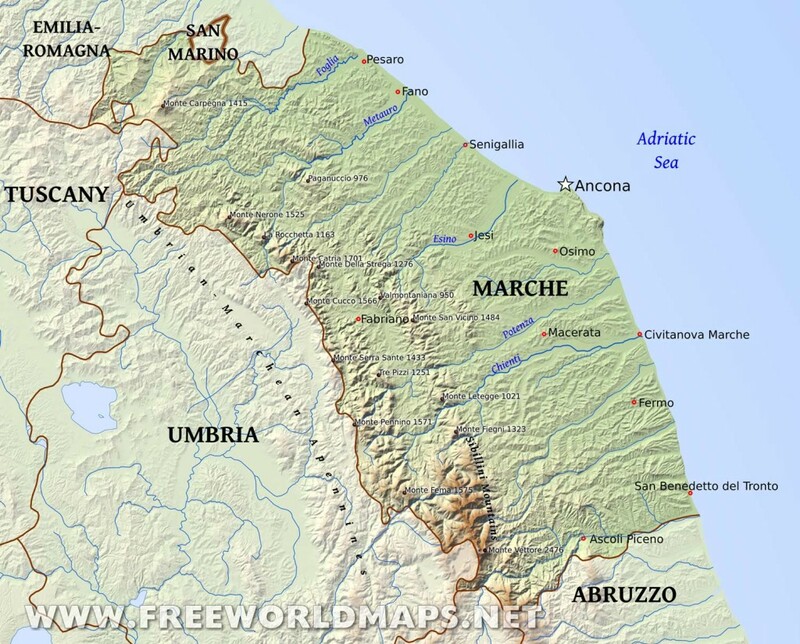 The region of Marches or Marche in Italy is situated East of Tuscany with beautiful coastlines along the Adriatic Sea. 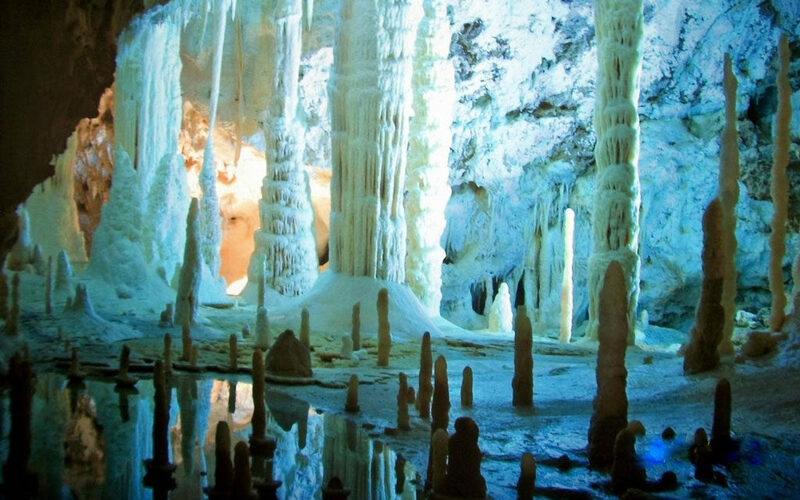 Lying between the Apennines and the Adriatic, Marche (sometimes anglicized as The Marches) is a varied region, and one you could spend weeks exploring. Large areas of it are unspoilt, particularly in the southwest between Macerata and the Sibillini mountains, where crumbling hill-villages make atmospheric bases for hikes into the stunning Monti Sibillini range. Not that all of Marche is free from tourism; much of its coastline is studded with modern grid-plan resorts, and ranks of sun-umbrellas fill many of its beaches. The area also has a fair amount of industry – in particular light engineering, shoe manufacturing and ceramics – heaviest around the port of Ancona and along the main road and rail route from Umbria. Of Marche’s old-fashioned and slightly forgotten seaside resorts, Pesaro is the largest with a Renaissance centre maintaining its dignity behind the package-tour seafront; for more interesting sunning and swimming it’s a better idea to head to the south of Ancona to the Conero Riviera, a spectacular stretch of coast, with small beaches nestling beneath the dramatic cliffs of Monte Conero. San Benedetto del Tronto has six kilometres of beach, five thousand palm trees, and numerous discos, but is not exactly a happening place compared with say Rimini. Really, though, the most appealing – and best known – of Marche’s sights are the small hilltop town of Urbino, with its spectacular Renaissance palace, and the fortress of San Leo, just across the border from San Marino. Further south, Macerata is a sleepy university town surrounded by lovely countryside, and, right on the regional border, the fascinating city of Ascoli Piceno is a worthy stop-off on the way into Abruzzo. Getting around on public transport is not too much of a problem, though you’ll obviously save time in the remotest parts of the region with your own vehicle. The provincial capitals – Urbino, Pesaro, Macerata, Ancona and Ascoli Piceno – are all well served by public transport; and Ancona is also a major port for ferries to Greece and Croatia. For hiking in the Sibillini, Amandola has the best bus service; if you don’t mind relying on fewer buses, Montefortino is a prettier base. Le Marche: an Insider’s Guide will help you discover Italy’s Marche, or Marches, region, the place to go if you want a taste of real Italy, an Italy still relatively untouched by the ravages of mass tourism. You’ll find plenty of outstanding art and architecture, discover enchanting small towns off the beaten tourist trail, and see some of central Italy’s most spectacular countryside. It has been written by British travel writer Peter Greene, who has lived and worked in the region for more than twenty years, and also runs the popular Marche Voyager website. It’s designed to give an honest view of the beauty and variety on offer, and uses a concise but intelligent style. It assumes most visitors are here to relax, and offers just enough to inform, without swamping the reader with endless details.